Because they’re great parents and do pretty much everything without human assistance, freshwater angelfish are insanely easy to breed. Conversely, successfully breeding and raising the fry of captive marine angelfish has traditionally frustrated and confounded hobbyists, and continues to do so. 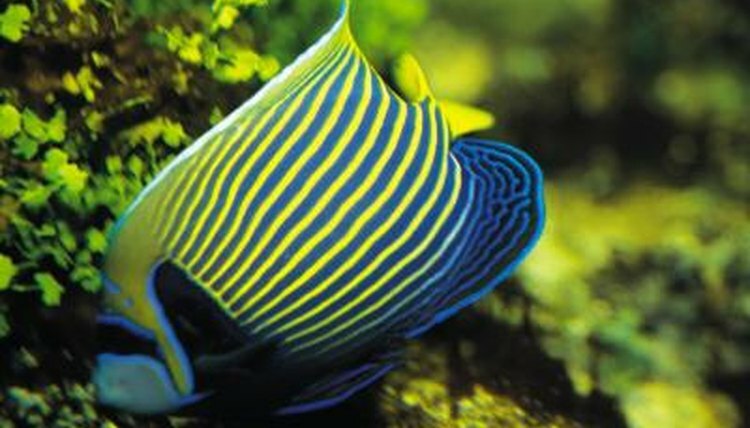 The marine angelfish family (Pomacanthidae) consists of seven genera divided into about 80 species. The Japanese and queen angelfish are among the hardiest and most commonly kept of readily available marine species. A freshwater angelfish (Pterophyllum scalare) pair chooses a smooth surface such as a flower pot, sword fern leaf or side of the aquarium and commence cleaning it together. After the female lays her eggs, the male follows and fertilizes them. They’ll hatch in 36 to 48 hours. The male Japanese angelfish (Centropyge interruptus) courts the female ardently, circling and rushing at her. Eventually he swims high above his lady love and poses motionless, extending all of his fins to display his finery to her. As she approaches him, he nuzzles her belly. Eggs and sperm are released in sudden bursts simultaneously. Their mission is complete and the eggs will hatch from 18 to 30 hours later. Queen angelfish (Holacanthus ciliaris) pairs bring their bellies together as they rise in the water. As the male releases sperm, the female sends forth 25,000 to 75,000 eggs that will hatch about 15 to 20 hours later. Exotic Pet: Keeping and Breeding Freshwater Angelfish! Can an Octopus Make a Good Pet?